This summer will be the 75th anniversary of the Minneapolis Teamsters Strike. Last December was the 10th anniversary of the raid on the protest occupation near Coldwater Spring, said by some to be the largest police action in Minnesota history. Next September will be the first anniversary of the Republican National Convention (RNC) in St. Paul. August and September 2012 will be the 150th anniversary of the Dakota-U.S. War of 1862. Each of these anniversaries will be controversial in one way or another, but weighing the nature of the controversy created by such anniversaries produces some interesting results. Perhaps the most interesting question is: When is an event too controversial for commemoration by institutions that consider themselves or strive to be mainstream? 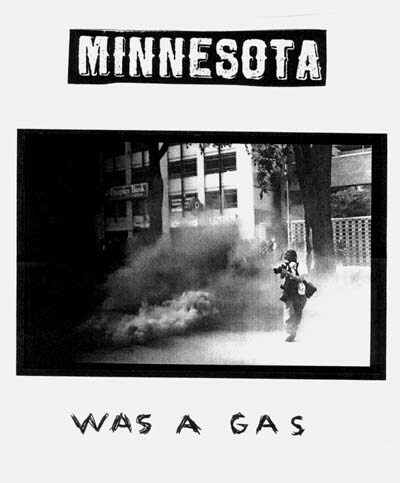 One of a series of posters created by the artist Alex Lilly inspired by what happened in St. Paul during the Republican National Convention in September 2008. This strike, also known as the Minneapolis Teamsters’ Strike and, alternately, sometimes called “a police riot,” was one of the most violent in the state’s history, and a major battle in Minnesota’s “civil war” of the 1930s between business and labor. A non-union city, Minneapolis business leaders had successfully kept unions at bay through an organization called the Citizens Alliance, but by 1934, unions were gaining strength as advocates of workers for improved wages and better working conditions. By early May 1934, one of the worst years of the Great Depression, General Drivers Local 574 of the International Brotherhood of Teamsters (IBT) had organized 3,000 transportation workers of the trucking industry into an industrial union. When employers refused to recognize the union, or its right to speak for all of its members, union leaders called a strike. Trucking operations in the city came to a halt. When police and National Guard were called in to guard trucks, and the Citizens Alliance activated the local militia, strike leaders countered with “flying squads” of pickets. To inform the public of the strike’s aims, and to keep workers informed of developments, strike leaders published a daily newspaper. They sought farmers’ cooperation. Conflict escalated daily throughout May and reached a peak late in the month, at the city market, where strikers clashed with police, who were trying to open it for farm produce to be brought in. The police force was increased for the battle. Many women strike supporters joined the strikers and were severely beaten. Hundreds of strikers were arrested. In support of the truckers, 35,000 building trades workers went on strike. The battle raged on violently for two days. The strike ended on May 25, when the union was recognized and their demands settled. Its toll: 200 injured; 4 dead. The strike marked a turning point in state and national labor history and legislation. The strike opened the way for enactment of laws acknowledging and protecting workers’ rights. In many ways this statement demonstrates the phrase that many Indian people repeat today, that “history is written by the winners.” The truckers won the trucker’s strike so their point of view is the one that has won out, even though you still meet a few people whose families were on the other side and who have a different point of view. The Minnehaha Free State/Liberated Zone in Minneapolis MN was raided Sunday morning at 4am by 600 State Troopers in what MN Governor Arnie Carlson has called the largest law enforcement operation in MN history. Police fired tear gas into all 7 seven houses occupied by a coalition of Big Woods Earth First! the American Indian Movement (AIM)and the Mendota Mdewakanton Dakota Community. 33 people were arrested, 20 of them from lockdowns. (included an activist in a Santa suit locked into the chimney of one of the homes) Many of the protesters where tortured with pepper spray and pain compliance holds. One protester who was locked by the neck to a tripod had his life put in serious danger when the police overturned the tripod without taking any precautions to protect him. The extent of his injuries remains unknown. Media were blocked from the site by a wall of riot police and there are extensive reports of police brutality. It is hard to imagine that there will ever be anything on these events on the website of the Minnesota Historical Society, because the Society embraced at the time, and still embraces, the point of view that these events never happened or that if they happened they should be ignored. It is hard to find a mainstream message useful to the Society in these events and so it is better not to mention them. Instead the history of these events is left for those who took part in them, or who were there at the time, to describe. Several books cover some of the events including Mary Losure’s Our Way or the Highway. A more complete account is found in the book compiled by Elli King, Listen: The Story of the People at Taku Wakan Tipi and the Reroute of Highway 55, or the Minnehaha Free State, published in 2006 (which oddly the Historical Society does not have in its library). A new movie produced by Oak Folk Films called Stop the ReRoute: Taking a Stand on Sacred Land based on footage taken at the time and interviews done since then is having its premiere on March 28. Eventually perhaps a so-called mainstream consensus may develop that this police action was a travesty, a mistake, and an abomination, but until then do not expect the Minnesota Historical Society to help out in recording or disseminating the history of that event. By contrast, a mainstream historical consensus has yet to develop about the RNC in St. Paul. Many who were at present at the police action along Highway 55 in December 1998 believe that they experienced the practice for what occurred in St. Paul less than ten years later. Memories of the RNC are very, very fresh. Trials are still taking place. Mayor Chris Coleman, a Democrat, who was mayor during the RNC, is running for re-election. Opinions are still bitterly divided. Supporters of the mayor say that people should move on and leave behind these historical controversies. Others demand some acknowledgement by the mayor and his supporters that grave mistakes were made by people who are still in positions of authority in St. Paul and in Ramsey County. Staff at the Minnesota Historcal Society have collected artifacts and ephemera from the RNC. But how long will it take before the Minnesota Historical Society or other such institutions will be able to have a page about the RNC on its website? It may depend on who is perceived as having won the battle of history. Ambrose, who was a far-seeing state official with an interest in the history of the Civil War concluded by stating that the story he told was just a fantasy, but that American Indians were treated worse than the fantasy he described. By 1987, the 125th anniversary of 1862, the mainstream white consensus about what had happened in 1862 had fallen apart completely. It was supposed to be the “year of reconciliation,” but the reconciliation did not occur. A consensus could not be reached even on what to call the events of 1862. It was plain that you could not call it the Sioux Uprising any more, after all the Indians in question wanted to be known by their own name for themselves, the Dakota. So what would it be, the Dakota Conflict? The U.S.-Dakota Conflict? The Dakota War? Among some Dakota people there was less of an interest in what you called the events. Instead, there was a desire for the wider society to acknowledge what had actually happened to their people in 1862. This was viewed as a necessary first step in the process of reconciliation. This suddenly made 1862 controversial again. At the Minnesota Historical Society there was a desire at first to engage with Dakota people about 1862, but many factors undermined that. A few of the more vocal Dakota people–particularly Chris Mato Nunpa–made life hard for the director of the Society, putting her between a rock and a hard place, the hard place being the opinions of the legislature which drive so many decisions about what history to commemorate and what history to ignore. As a result, the director of the MHS was instructed by her board not to speak to him anymore (although since the board of the historical society is appointed by the director, it is hard to know who instructed whom to do what). To avoid speaking with Mato Nunpa the Society created a Indian-advisory committee, so that she would not have to speak to Mato Nunpa but could still be seen as being responsive to the opinions of Indian people. Needless to say Mato Nunpa was not on this committee. But the committee has not solved the Historical Society’s Indian problem, primarily because–here’s a shocker–no one speaks for all Indians, any more than there is anyone who speaks for Norwegians or Italians. Even if the Society were to make the committee representative only of tribal governments–which would be a very odd thing for a non-governmental entity like the Historical Society to insist on doing–there is still a diversity of opinion within and apart from those tribal governments. In any case, the Historical Society emphasizes that this committee is advisory, that it does not have veto power over the insitution, which means that the Society sets itself up for discontent anytime it does not follow the wishes of the committee. In 1862, Minnesota was still a young state, part of a frontier inhabited by more than one million Indians. Times were hard and Indian families hungry. When the U.S. government broke its promises, some of the Dakota Indians went to war against the white settlers. Many Dakota did not join in, choosing to aid and protect settlers instead. The fighting lasted six weeks and many people on both sides were killed or fled Minnesota. Former Minnesota governor Henry Sibley led an expedition of soldiers and Dakota scouts against the Dakota warriors. 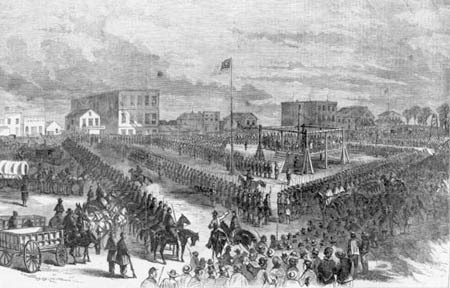 The war ended on December 26, 1862, when thirty-eight Dakota Indians were hanged in Mankato in the largest mass execution in U.S. history. Afterwards the government forced most of the remaining Dakota to leave Minnesota. For white Minnesotans, their experience of blood and terror negated all promises they had made to the Dakota. Stories and history books told about the great “Minnesota Massacre,” but for many years the Indian side of the story was ignored. Whites had their time of blood and terror, the Indians were were subjected to the largest mass-hanging in American history, then exiled from their land. Everyone has opinions. What is the Indian side of the story? There is no elaboration here, but the page gives helpful sources for learning those points of view, through books like Through Dakota Eyes: Narrative Accounts of the Minnesota Indian War of 1862, edited by Gary Clayton Anderson and Alan R. Woolworth (1988) and the papers of Bishop Henry B. Whipple who was one of the few defenders of Dakota people in 1862 or later. The Lower Sioux Agency is an important historic site with a crucial story that needs to be preserved and told. The U.S. government administrative center for the Dakota in the mid-19th century, it was the scene of the first attack in the U.S.-Dakota War of 1862. The goal of its interpretive program is “to accurately and sensitively portray the powerful and complicated history of the site as well as its historical context,” according to Heather Koop, head of the Society’s southern district historic sites. This management agreement represents an opportunity to expand the use of the site by operating the facility as a year-round cultural center, as well as a seasonal historic site open to the public as it is now. The arrangement also will allow the site’s interpretation to broaden, encompassing expanded aspects of the area’s history, including present-day Dakota culture. The biggest problem that the Historical Society and other such agencies will have in the next few years will not likely be Angela Waziyatawin, but rather the fact that there are white communities where the previous mainstream white consensus about 1862 lives on, which will prevent the institution from responding reasonably to the criticisms of Dakota people. Reconciling these points of view and the opinions of the Minnesota legislature will tie the Historical Society in knots for the next few years. It should be a very interesting and challenging time for the history of history in Minnesota. My father was unemployed during the trucker’s strike and went to the market to watch the action. He witnessed the violence against the striking truckers, including at least one death. His account of the events was consistent with the truckers.